Clinical studies and trials have shown that the use of tooth preparation methods does not seem to improve the retention or the fracture strength of the reattached fragment. ,,,, Therefore, though the experimental models point out to the necessity of making an additional tooth preparation, actual clinical research has shown a positive follow-up even in cases of reattachment without preparation. As for all the body elements that have suffered traumatic injuries, even teeth restored with the fragment reattachment technique must undergo follow-up controls. It is necessary to keep checking the results and the stability of the tooth-adhesive-fragment complex over time, with intraoral radiographs and clinical assessments after the treatment. The aim is to evaluate the pulp vitality and color match. The authors here have elucidated a clinical case resolved with a tooth fragment simple-reattachment technique. This clinical case is characterized by multiple traumatic injuries, which require different therapeutic solutions. A 24 year old male patient, a basketball professional player, suffered a traumatic crown fracture of the upper right central incisor (11), with the fracture line being located in the middle third of the tooth. The patient reported promptly to the clnician with the fractured fragment. The tooth involved showed no evidence of pulpal exposure or of periodontal lesions consequent to the dental injury. Our operative protocol, preliminarily to any restorative step, started with a clinical examination in order to evaluate the traumatic injury, and the condition and the margins of the fragment. The fractured tooth was evaluated by trans-illumination in order to rule out the presence of enamel fissures. In the radiographic assessment, there was no fracture of the root or the alveolar bone [Figure 1]. We decided to proceed with the attachment of the fractured fragment with no additional tooth preparation as there was no loss of dental hard tissues and the edges matched without any disruptions. The fragment was treated with an "etch and rinse" technique using 37% phosphoric acid (The acid time application was related to the different tooth surface. It was 30 seconds for enamel, 1s seconds for dentine), followed by a separate application of priming and bonding agents (Scotchbond MP, 3M ESPE), and the fragment was kept away from light or heat sources until the reattachment phase. The fractured tooth was etched and treated with the same adhesive system (Scotchbond MP, 3M ESPE). The fragment was thus placed in its proper position on the tooth paying attention to the perfect fit between the two parts and only after this point was the bonding agent photopolymerized. The polymerization was carried out on both the vestibular and lingual aspects using a 60 seconds for each surface light-emitting diode (LED) light-curing unit (Elipar Freelight 2, 3M Espe). The restored tooth was then finished and polished using silicon points immediately after the fragment reattachment (HiLuster Plus Identoflex, KerrHawe) . Patient was then recalled for a follow up control at 6 and 12 months. All the clinical evaluation demonstrated a good maintaining of the previous treatment with good aesthetics and function. 25 months later the patient injured the same tooth during a sport activity and sustained a small enamel fracture at the incisal margin of the fragment reattached [Figure 2]. The other maxillary central incisor (21) was involved by a small enamel lesion too caused by the same traumatic event. At this time vitality test by giving thermal stimulus to the tooth (cold) was performed again and the tooth was still vital. The clinicians observed the stability of the fragment. Therefore, a direct restoration of both of the fractured teeth was performed using Scotchbond MP (3M Espe) and composite resin (Filtek Supreme, 3M Espe). Patient was recalled for follow up control at 3 months and no function, clinical or aesthetic problems were recorded. However, 4 months later a new trauma caused the detachment of the fragment. After clinical evaluation the treatment plan of choice was the same one used on the occasion of the first fracture [Figure 3]. After 3 years (5.5 years from the first injury) a follow-up control was performed. Aesthetics and pulp vitality were confirmed clinically. A radiographic control showed no evidence of periapical pathology [Figure 4]. 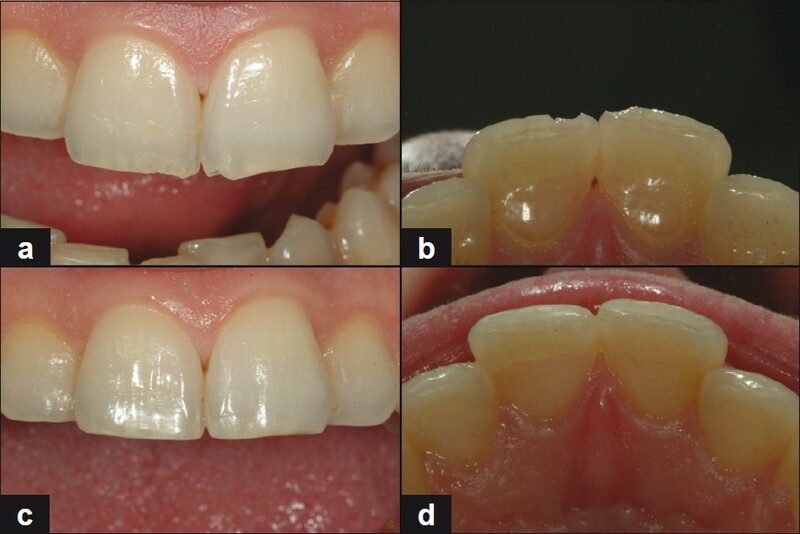 This clinical case report tries to throw light on certain aspects of the reattachment technique used on fractured teeth. Among all the possible operative solutions of this technique, the authors chose to remain most conservative, and did not perform any preparation on the fractured margins. In fact, this choice is determined by both: the absence of macroscopic losses of dental substance and the fractured fragment; and, by the consideration that although the absence of an additional preparation determines an inferior resistance compared to the natural tooth, the results appear to be sufficiently stable. Andreasen et al., used All-Bond 2 and Scotchbond MP to reattach crown fragments to the remaining portion of sheep incisors loaded at differen loading rates. They suggested that reattachment with a bonding resin of the enamel dentin crown fragment after crown fracture is a realistic alternative to composite resin build up, although only half the strength of the intact tooth is achieved. Munksgaard et al., reported the same values. The primary cause of failure of the reattached tooth fragment is a new trauma or the use of the restored tooth with excessive masticatory forces, which justify many previous attempts to improve the fracture strength of the re-bonded fragment. 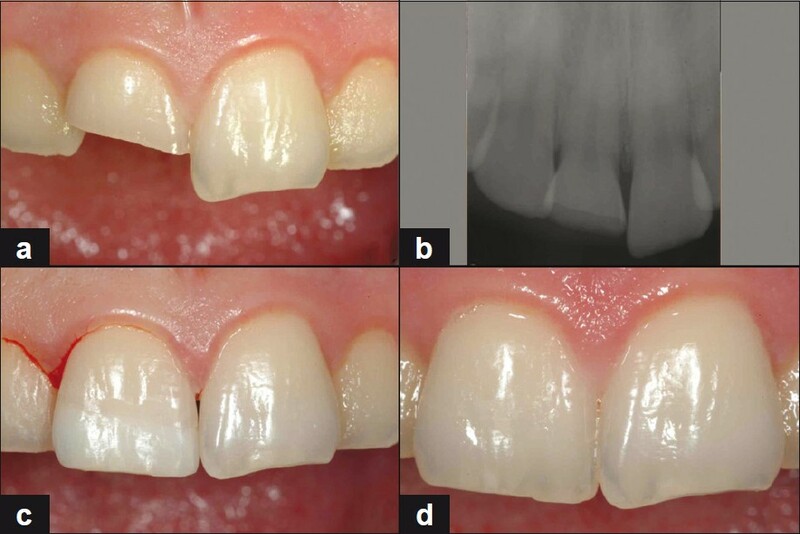 This case report shows how a simple fragment reattachment, performed without any additional preparation, can be realized by using resin. The upper incisors area is a very aesthetic zone and it is often related to trauma. However, the application of new generation materials ensures long term and aesthetic results in the area. The second trauma caused only minimal loss of substances in the same reattached fragment, and did not influence its retention. Besides, the absence of intermediate material facilitated the retreatment for the resolution of the third trauma. According to our clinical evaluation, the restoration of a fractured crown using the adhesive reattachment is the optimal treatment for an enamel-dentin fracture when the tooth fragment is available, intact and well preserved. The clinical results appear to be positive and they show that this technique is easy to perform and standardize, inexpensive, and that it allows both functional and aesthetic recovery. In fact, the reattachment technique helps avoid the silicon matrix that is required to model the palatal surface properly to create a base for the subsequent composite layering. When compared to more aggressive prosthetic techniques like crowns and veneers, the reattachment technique is both conservative and aesthetic. Using this treatment procedure it is possible to achieve long-term retention and good mechanical resistance of the tooth-fragment complex. Our clinical experiences, in accordance with literature data, prove that when the fragment is quickly reattached it is possible to preserve pulp vitality. The quality of the adhesion turned out to be suitable although an ultra-conservative technique was preferred without any type of preparation and only with the use of the bonding method. This assertion is based on long-term controls and on the verification that the second trauma caused only partial enamel fractures within the bonded fragment; and, only the third additional trauma caused the fragment's detachment. In any case, it was possible to perform the reattachment again with positive outcomes. 1. Reis A, Loguercio AD. Tooth fragment reattachment: current treatment concepts. Pract Period Aesthet Dent 2004;16:739-40. 2. Andreasen JO, Andreasen FM. Textbook and color atlas of traumatic injuries to the teeth. Copenhagen: Munksgaard Publishers; 1993. 3. Eden E, Yanar SC, Sönmez ª. Reattachmnet of subgingivally fractured central incisor with an open apex. Dent Traumatol 2007;23:184-9. 4. Pusman E, Cehreli ZC, Altay N, Unver B, Saracbasi O, Ozgun G. Fracture resistance of tooth fragment reattachment: Effects of different preparation techniques and adhesive materials. Dent Traumatol 2010;26:9-15. 5. Demarco FF, De Moura FR, Tarquinio SB, Lima FG. Reattachment using a fragment from an extracted tooth to treat complicated coronal fracture. Dent Traumatol 2008;24:157-61. 6. Arhun N, Ungor M. Re-attachment of a fractured tooth: A case report. Dent Traumatol 2007;23:322-6. 7. Badami AA, Dunne SM, Scheer B. An in vitro investigation into the shear bond strengths of two dentin bonding agents used in the reattachment of incisal edge fragments. Endod Dent Traumatol 1995;11:129-35. 8. Reis A, Francci C, Loguercio AD, Carrilho MR, Rodriguez Filho LE. Re-attachment of anterior teeth: fracture strength using different techniques. Oper Dent 2001;26:287-94. 9. Reis A, Loguercio AD, Kraul A, Matson E. Reattachment of fractured teeth: A review of literature regarding techniques and materials. Oper Dent 2004;29:226-33. 10. Pusman E, Cehreli ZC, Altay N, Unver B, Saracbasi O, Ozgun G. Fracture resistance of tooth fragment reattachment: Effects of different preparation techniques and adhesive materials. Dent Traumatol 2010;26:9-15. 11. Demarco FF, Fay RM, Pinzon LM, Powers JM. Fracture resistance of re-attached coronal fragments - influence of different adhesive materials and bevel preparation. Dent Traumatol 2004;20:157-63. 12. Osborne JW, Lamsen RL. Reattachment of fractured incisal tooth segment. Gen Dent 1985;3:516-7. 13. Dickerson WG. Conservative reattachment of a pulpally exposed, fractured incisor. Dent Econ 1994;84:90-1. 14. Worthington RB, Murchison DF, Vandewalle KS. Incisal edge reattachment: The effect of preparation utilization and design. Quintessence Int 1999;30:637-43. 15. Farik B, Munksgaard EC, Andreasen JO, Kreiborg S. Fractured teeth bonded with dentine adhesives with and without unfilled resin. Dent Traumatol 2002;18:66-9. 16. Andreasen FM, Steinhardt U, Bille M, Munksgaard EC. 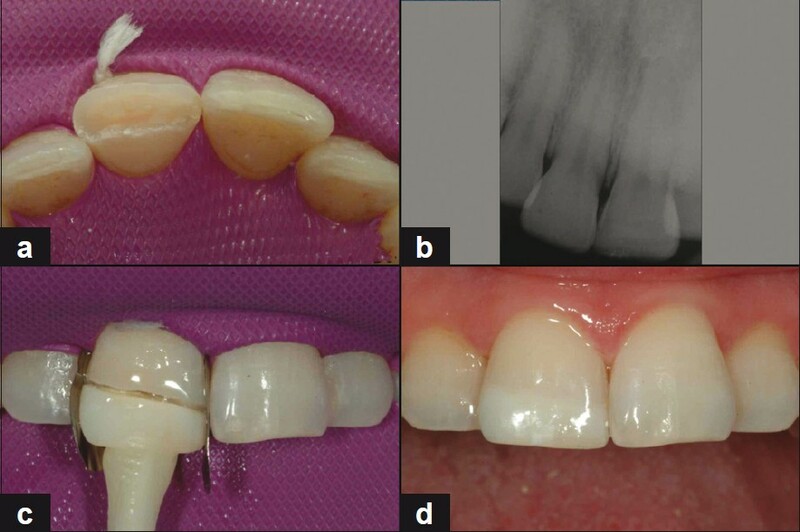 Bonding of enamel-dentin crown fragments after crown fracture. An experimental study using bonding agents. Endod Dent Traumatol 1993;9:111-4. 17. Munksgaard EC, Hojtved L, Jorgensen EH, Andreasen FM, Andreasen JO. Enamel-dentin crown fractures bonded with various bonding agents. Endod Dent Traumatol 1991;7:73-7. 18. Wiegand A, Rödig T, Attin T. Treatment of crown fractured incisors: Reattachment instead of restoration? Schweiz Monatsschr Zahnmed 2005;115:1172-81. 19. Andreasen FM, Steinhardt U, Bille M, Munksgaard EC. Bonding of enamel-dentin crown fragments after crown fracture. An experimental study using bonding agents. Endod Dent Traumatol 1993;9:111-4.